The BAFTa show on BBC is only starting in half an hour so if you don't want to know if the Lego Movie won in.it's category don't read on. Still reading? Good, it won! Well done Chris & Phill. Pleased to hear it won as well, genuinely one of my fave films of the year. 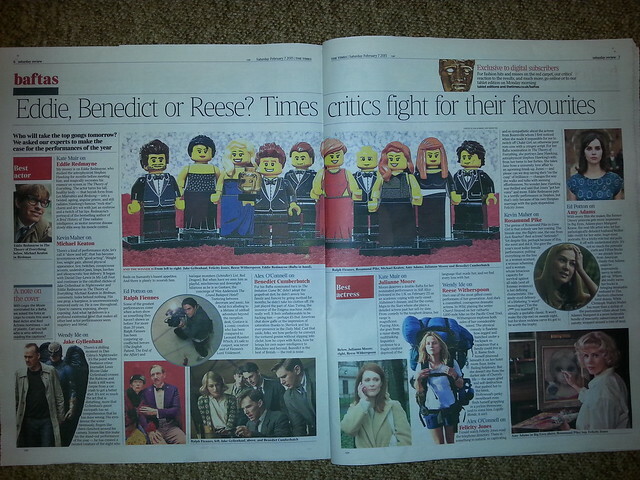 The Times seems to have been fairly convinced it would, considering their prolific use of our minifigs in the BAFTA coverage in the paper yesterday! Didn't find out till the end of the show, but a double fist pump from me upon finding out. Well at least one of the awards ceremonies isn't a waste of space joke then. I don't think TLM winning is that big a deal here. Sure, it won the BAFTA, but no-one is really talking about it. The big talking points are Theory of Everything and Boyhood winning numerous (important) awards, and The Imitation Game winning absolutely none. The Grand Budapest Hotel (which won most awards) is not being discussed much as they are pretty minor awards that it won. Animation comes way way below that. 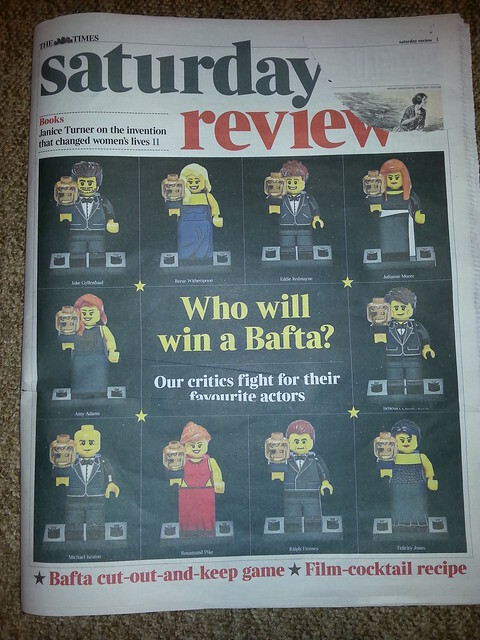 @MinifigsMe I'd like to see a picture of the Lego actors (in character) clutching a Lego head bafta each for their performances. Lord Business - collects Best Wardrobe bafta on behalf of the team responsible for his cape, legs and that headgear. And so on, just for a bit of fun! Could you oblige, please, pretty please? - Although I feel bad for bad cop then, any other ideas? ^ Bad Cop - Special Effects?